In an Emerging Science session at the 69th Annual Meeting of the American Academy of Neurology, results were presented of the ACT2 study of electroCore’s gammaGore device in the treatment of acute episodic and chronic cluster headache (eCH and cCH, respectively). 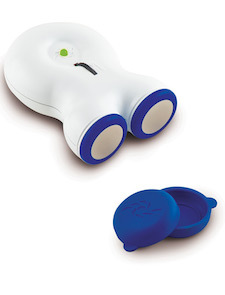 The device is a non-invasive vagus nerve stimulator, placed on the neck to provide a mild electrical charge through the skin in order to alleviate pain. The findings of ACT2, as presented at the meeting, support that FDA response. The study was randomized, double-blind, and sham-controlled. Subjects in the study self-administered the stimulation along the neck in the area of the cervical branch of the vagus nerve in 3 consecutive, 2-minutle long applications. If the attack had not ceased within 9 minutes, they were allowed 3 more applications, though rescue treatments were not permitted for 15 minutes following the beginning of the attack. Pain was judged on a 0 to 4 scale, with a primary endpoint of achieving 0 and secondary endpoints of any change in pain status as well as “proportions of subjects with responder status (pain score=0-1) for ≥50% of attacks.” A total of 48 subjects received the treatment (14 with eCH, 34 with cCH) and 44 received the sham treatment (13 eCH and 31 cCH). In the eCH group, the device showed superior results towards the primary endpoint over sham, 48% to 6% (PP=0.01); no such differentiation was seen in the cCH subgroup. For the responder status secondary endpoint, the gammaCore produced significantly higher numbers than sham (40% to 14%).
" The eCH cohort also saw a significantly greater percentage of patients respond to non-invasive vagus nerve stimulation (nVNS; no or mild pain) at 15 minutes for ≥50% of their attacks (64.3%) versus sham (15.4%; p = 0.01)," according to a press release from earlier today. The study “supports the acute use of nVNS in patients with eCH but not cCH.” That conclusion seems to match the perception of the United States Food and Drug Administration, which just last week released the device for use in the treatment of eCH. Francis R. Amato, CEO of electroCore, was quoted with great at the time of the FDA’s announcement, saying that his company is “leading the way for the future of medicine through the development of patient-administered, non-invasive vagus nerve stimulation therapy.” Stephen Silberstein, MD, who is Director of the Headache Center at Jefferson University in Philadelphia, said such treatment “does not have the side effects or dose limitations of commonly prescribed treatments or the need for invasive implantation procedures, which can be inconvenient, costly and high-risk." Such treatment, which has the advantage of being something patients can self-administer instantly as needed, has been explored for other forms of pain, including rheumatoid arthritis. The device is supposed to become commercially available later this year.